We're almost finished a couple of books and so next week you can look forward to us starting a couple of new ones. As to our Forums... we're making good progress. The 3.7.0 version has now been released and we've already downloaded it and will be getting it installed over the weekend. As there are some excellent new facilities in this release it does mean there is more to configure. We've already set up the initial public forums and we've tested out the blogs, RSS and Calendar facilities and all those are now working properly. We need to configure the personal picture gallery and then customise the look and feel of the service. So we're getting near the initial launch. There are a lot of social networking facilities in this product and likely lots to learn as we work through all the facilities. At the end of the day we want to offer a really unique look and feel to this service which we hope you will enjoy. We certainly hope that this service will become a huge meeting place on the web for the Scots Diaspora around the world. Should you have an organisation, clan society or have a group that would benefit from having your own public forum then feel free to tell us about it and we'll consider adding a forum in for your group. The Calendar program is very powerful and we're considering if it would be possible to use it as a replacement for our current calendar program to record Scottish events around the world. It's the beginning of May and the Scottish tourist season is now well and truly underway. One attraction which is growing in popularity, year on year, is the Castle of Mey. The Castle of Mey (formerly Barrogill Castle) is in Caithness, close to the most northerly point of the Scottish mainland. For almost half a century, until her death in 2002, it was the Scottish retreat for her Majesty Queen Elizabeth, The Queen Mother. It's said that she first saw what was Barrogill Castle in 1952 when she was mourning the death of her husband, King George VI. At that time it was a ruin but The Queen Mother restored it and she spent many a summer there, enjoying the peace and tranquillity and the views across the Pentland Firth. In 1996 it was gifted to the Castle of Mey Trust and six years ago the Castle of Mey was opened to the public. Today, May 1st, the 2008 visitor season starts. Its popularity continues to increase every year, with a record number of more than 29.000 visitors enjoying its grounds and famous gardens in 2007. This weeks Flag is compiled by Jim Lynch and as always lots of interesting articles. The John Mann Park in Carnwath should be a colourful spectacle on Saturday 22 June 2008 as the town celebrates the 500th anniversary of the famous Red Hose Race. The race usually restricted to Carnwath and the adjoining parishes has been expanded this year to everyone over the age of sixteen living in South Lanarkshire – but the three-mile race will be restricted to 150 runners. A Fun Day has been organised around the race and those attending are encouraged to wear medieval dress in order to mark the event’s origin which goes back to a Charter by James IV, King of Scots, to John, third Lord Somerville ordering that the race winner should be given a pair of red hose. A fast runner, easily identified, was a military necessity, as the runner could quickly bring word to Edinburgh of the approach of any invading English army. The race has continued down five centuries and in 2006 was entered in the Guinness Book of Records as the ‘Oldest Road race’ in the world. Among the competitions surrounding the race this year will be the opportunity to become the official Red Hose Knitter. This is open to all knitters in South Lanarkshire, and all you have to do is take your pair of red knitted hose along on the 22 June 2008. Carnwath has a long history – in the middle of its golf course the Libberton Motte is an impressive relic of the earthworks of a fortification possibly built by William de Sommerville (d 1160) who came from Yorkshire, England, to Scotland in the train of David I, King of Scots. The Sommervilles went on to live in the ruined Couthally Castle and founded a collegiate church of which the north aisle (15th century) survives next to a later parish church. A burgh of barony since 1451, Carnwath underwent industrial development in the 18th century when two brothers from London called Wilson established an iron foundry (1779) and coalmining followed in the 19th century. The town’s Market Cross dates from 1516, shortly after the famous Red Hose Race was run for the first. Method: Pre-heat the oven to gas mark 2, 300°F (150°C). First discard the tough outer leaves of the cabbage, cut it into quarters and remove the hard stalk. Then shred the rest of the cabbage finely, using your sharpest knife (although you can shred it in a food processor, I prefer to do it by hand: it doesn't come out so uniform). Next, in a fairly large casserole, arrange a layer of shredded cabbage seasoned with salt and pepper, then a layer of chopped onions and apples with a sprinkling of garlic, spices and sugar. Continue with these alternate layers until everything is in. Now pour in the wine vinegar, lastly add dots of butter on the top. Put a tight lid on the casserole and let it cook very slowly in the oven for 2-2½ hours, stirring everything around once or twice during the cooking. 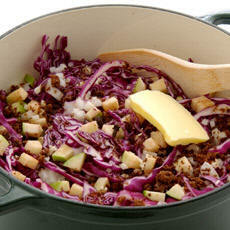 Red cabbage, once cooked, will keep warm without coming to any harm, and it will also re-heat very successfully. And, yes, it does freeze well so, all in all, it's a real winner of a recipe. Jock Mackenzie lived on a wee croft just outside of Alness. One night as he was going up to bed, his wife complained to him that he'd left the light on in the shed, which she could see from the bedroom window. Jock opened the back door to go out to the shed to turn off the light but saw that there were villains in his shed stealing things. He dialled 999 to get the police, identified himself and reported what he had seen. Sergeant Wallace responded, "Have they broken into yer hoose house then, Jock?' Jock replied, "No." Sgt. Wallace then stated that the police patrols were busy on other calls and that Jock should simply lock his door and a constable would be along when available. Jock hesitantly said, "Alright" and hung up. Jock sat down, poured himself a wee dram, slowly drank it, then telephoned Sgt. Wallace once again. "Hello, Sergeant, I called a while back to tell you that there were people stealing things from my shed. Well, you needn’t bother about them noo ‘cause I just shot them both with my fowling piece." Then he hung up. Within five minutes three police cars, and an ambulance came racing up to Jock’s croft with lights ablaze and sirens wailing. The constables and Sergeant Wallace caught the burglars red-handed. Sergeant Wallace marches up to Jock, standing in his doorway and exclaims to him: "I thought you told me that you'd shot them!" Jock replied with a smug grin "And I thought you told me that there was nobody available!" Ye can’t beat a canny Highlander! Also got in an interesting book review by the author which you may well find interesting. We are now onto the M's with Morton, Morville, Motherwell, Moubray, Mowat, Mudie, Munro, Mure and Murray added this week. The account of Murray includes some excellent biographies of noteable people of that name including, Sir Robert Murray, William Murray, Lord George Murray and others. Name.—The name Clatt, or, as it was formerly written, Clet or Clett, is obviously derived from the Gaelic word Cleith, pronounced Cleit, which signifies concealed. This etymology of the word is in strict accordance with the locality of the parish. It is concealed from the view on every side. Situation.— This parish is situated in the western extremity of Garioch,—one of the five divisions or districts of the county of Aberdeen. Extent.—It is about 4 English miles in length, and varies from 2 to 3 English miles in breadth, comprehending a space of nearly 9 square miles. The history of this parish at a remote period is involved in much obscurity. It appears, however, by the privileges conferred upon the town and village of Clatt by one of our Scottish Kings, that it was not deemed unworthy of the exercise of the royal prerogative. By letters of gift and donation from King James IV. 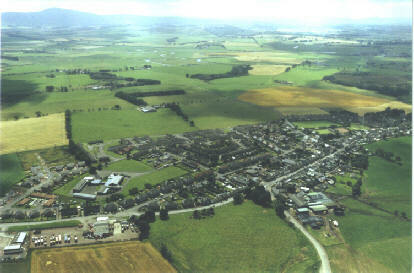 of Scotland, "the village of Clatt was erected into a free burgh of barony, with all the rights and privileges thereof; with power to the proprietor at that time, and in all time thereafter, to constitute and appoint bailies and other officers necessary for guiding, governing, and ruling the said burgh; and to have, hold, and keep therein a cross and market upon Tuesday every week, and public fairs and markets every year, for the space of eight days, with the liberties, profits, duties, and commodities thereof, in terms of the foresaid grant and donation." In virtue of this royal grant, letters of publication have been issued at different times by warrant of the Lords of Council and Session in Scotland; and the powers thereby conferred have been exercised by successive proprietors for the improvement of the burgh. Of the nature and extent of some of the baron's powers in the maintenance of his jurisdiction, there still exist distinct vestiges. On the summit of a rising ground contiguous to the village, there is pointed out the site on which the gallows stood, at the period when justice was summarily executed; and the eminence still bears the name of the Gallows Knoll. Proprietors.—The whole parish of Clatt belongs to two landowners ; James Adam Gordon, Esq. of Knockespoch, who has a family seat in the parish, but whose principal residence is in England, where his extensive estates are situated; and Sir Andrew Leith Hay of Rannes, whose mansion-house is in the neighbouring parish of Kennethmont. There is no plan of the whole parish extant, but correct surveys, by professional men, have been made at different times, for the private use of the landed proprietors. The Earl of Wigton, whose name figures in Scottish annals of the reign of Charles II, had three daughters, named Lady Frances, Lady Grizel, and Lady Jean, — the last being by several years the youngest, and by many degrees the most beautiful. All the three usually resided with their mother at the chief seat of the family, Cumbernauld House, in Stirlingshire; but the two eldest were occasionally permitted to attend their father in Edinburgh, in order that they might have some chance of obtaining lovers at the court held there by the Duke of Lauderdale, while Lady Jean was kept constantly at home, and debarred from the society of the capital, lest her superior beauty might interfere with and foil the attractions of her sisters, who, according to the notion of that age, had a sort of "right of primogeniture” in matrimony, as well as in what was called "heirship." It may be easily imagined that, while the two marriageable ladies were enjoying all the delights of a third flat in one of the "closes" of the Canongate, spending their days in seeing beaux, and their nights in dreaming of them, Lady Jean led no pleasant life amidst the remote and solitary splendour of Cumbernauld, where her chief employment was the disagreeable one of at tending her mother, a very infirm and querulous old dame, much given (it was said) to strong waters. At the period when our tale opens, Lady Jean’s charms, though never seen in the capital, had begun to make some noise there; and the curiosity excited respecting them amongst the juvenile party of the vice-regal court, had induced Lord Wigton to confine her ladyship even more strictly than heretofore, lest perchance some gallant might make a pilgrimage to his country seat, in order to behold her, and from less to more, induce her to quit her retirement, in such a way as would effectually discomfit his schemes for the pre-advancement of his elder daughters. He had been at pains to send an express to Cumbernauld, ordering Lady Jean to be confined to the precincts of the house and the terrace-garden, and to be closely attended in all her movements by a trusty domestic. The consequence was that the young lady complained most piteously to her deaf old lady-mother of the tedium and listlessness of her life, and wished with all her heart that she was as ugly, old, and happy as her sisters. Why is the mountaineer so attached to his Highland home? We do not say that the home-sickness, or mal du pays, is peculiar to the mountaineer, but only that in him it is peculiarly intense and passionate. This cannot always be accounted for by the grandeur of the scenery among which he lives. The inhabitants of most parts of Switzerland, for example, are notoriously obtuse to the beauty and magnificence which constantly surround them. From our own observation, we agree with Mr Buskin in what he says regarding the poor peasants of that glorious land :—" They do not understand so much as the name of beauty or of knowledge. They understand dimly that of virtue, love, patience, hospitality, truth. These things they know. . . . For the inhabitant of these regions the world is vapour and vanity. For him neither flowers bloom, nor birds sing, nor fountains glisten ; and his soul hardly differs from the gray cloud that lives and dies upon his hills, except in having no fold of it touched by the sunbeams." Yet these men cling with enthusiastic fondness to their mountain-home. It is true, that the Scottish Highlander possesses much more than the Swiss peasant of that mental culture which seems necessary in order to relish the beautiful in nature or in art. His superiority in this respect is owing, probably, to the education he has acquired from the parish school, with which his country has been blessed since the Reformation; to those social habits which make the upper and lower classes mix so much together in the Highlands; to the intellectual, as well as spiritual, training of the pulpit; and to the historical traditions, the interesting moral tales, and singularly pure and beautiful poems which are recited to the groups around the fireside when shut up in their secluded valleys during winter. There is, accordingly, often found in the Scottish Highlander a keen appreciation of the natural beauty of his mountain-land; and among no people have more local poets been found who, in devout hymns, tender songs, and romantic ballads, have described the varied aspects of nature with more truth, or in more felicitous language. Gingerbread. A good plain gingerbread is prepared as follows: Melt 1/4 lb. sugar, 1/2 lb. margarine, and 3/4 teacupful of golden syrup in a saucepan over the fire. Beat up 2 eggs, and when the melted syrup is cool, add them to it and beat all together. Sieve together 1 lb. flour and 2 teaspoonfuls of ground ginger, make a well in the centre, and into it pour the syrup, etc.. mixing and beating the whole thoroughly. Dissolve 1/2 flat teaspoonful bicarbonate of soda in 1/2 gill of milk, mix it with the other ingredients, and turn the mixture into a greased cake-tin. Bake the cake in a moderately hot oven for 1 to 1/2 hours, then turn it on to a sieve and leave until cold. The temperature of the oven should always be fairly high before cakes are put in. In a gas oven the burners should be left full on for about 10 min. previously and turned down about half way when cake is put in, i.e. rather less than half way for a 'brisk' oven and rather more than half way for a 'slow' oven. The oven door should not be opened for at least 20 min. after a cake has been put in, and when baking sponge cake, not until cake is likely to be done. The oven, it is to be noted, should be hotter for small and light cakes than for fruit cakes. THE demand for a third edition of "How to Read Gaelic" has afforded the Authors an opportunity of making a few alterations on the earlier editions. The Title has been altered at the suggestion of some who considered that the work was well adapted for a somewhat wider purpose than that of a mere collection of Reading Lessons. The various sections of the work have also been arranged in a more natural and convenient order for practical use. Beyond this the book is substantially a reproduction of the former editions. The specific pieces--"Coire-na-Sithe," and "Finlay's Letter to his wife"—provided to meet the requirements of the first stage of the Gaelic Scheme adapted to the Code by Mr Robertson, H.M.I.S., have been retained, notwithstanding the changes recently introduced by the Education Department. These pieces, and indeed the whole work, are still suitable for the first year or more of Pupil Teachers' work, the P.T. 's being still liable to examination under the Code, and retaining the benefit of taking Gaelic at the King's Scholarship examination. Of the two lessons—"Calum Seoladair" and "Am Mac Strodhail"—which are given with an interlinear literal English rendering, it may be remarked that they contain a variety of practicable and convenient phrases and idioms, the possession of which by the pupil will form an important basis uponn which to build his acquisitions in Gaelic Grammar. Before attempting to define the place of Burns in Scottish literature it may be well to clear away some misconceptions to which Taine, the great French critic, has given currency. In his English Literature, he traces the inspirational ideas of Burns largely to German and French sources. In the words of Taine: "Thus rises the modern man impelled by two sentiments, one democratic, the other philosophic. From the shallows of his poverty and ignorance he rises with effort, lifting the weight of established society and admitted dogmas, disposed either to reform or to destroy them, and at once generous and rebellious. These two currents from France and Germany at this moment swept into England. The dykes were so strong they could hardly force their way, entering more slowly than elsewhere, but entering nevertheless. The new spirit broke out first in a Scotch peasant, Robert Burns." Taine's tendency to sum up historic epochs in neat portable generalizations never led him farther astray than in his attempt to define the intellectual environment of Burns. Till Carlyle began to write, Scotland knew next to nothing of German speculative philosophy. True, De Quincey and Coleridge had dabbled in transcendentalism, but it will hardly be contended that these writers lived in the Burns period. There is more plausibility in the view that Burns was subject to French influence, notably Rousseau. Between Burns and Rousseau there is undoubted resemblance. Both sprang from the people, both were at war with the conventionality of their time, and both broke away from the classical standard of literature. But it is surely going beyond the mark to argue from resemblance to dis-cipleship. It does not follow that because both writers adopted a new attitude towards Nature, for instance, that Burns took his keynote from Rousseau. The truth is, Scotland before France showed a tendency to naturalism as opposed to classic artificiality. This fact is admitted by Taine when, in dealing with the poetry of Thomson, he says: "Thirty years before Rousseau Thomson had expressed all Rousseau's sentiments, almost in the same style. Like him, he painted the country with sympathy and enthusiasm. Like him, he contrasted the golden age of primitive simplicity with modern miseries and corruptions. Like him, he praised patriotism, liberty, virtue; rose from the spectacle of Nature to the contemplation of God, and showed man glimpses of immortal life beyond the tomb." Clearly we must look elsewhere than to Rousseau for the intellectual environment of Burns. Suppose we look nearer home. We can fairly well account for the intellectual outlook of Burns without going outside our own island. Burns appeared upon the scene when two antagonistic theories of man and society were contending for mastery —Calvinism and Moderatism. TO give a proper account of the Sutherland Clearances would take a bulky volume. Indeed, a large tome of 354 pages has been written and published in their defence by him who was mainly responsible for them, called "An Account of the Sutherland Improvements," by James Loch, at that time Commissioner for the Marchioness of Stafford and heiress of Sutherland. This was the first account I ever read of these so-called improvements; and it was quite enough to convince me, and it will be sufficient to convince anyone who knows anything of the country, that the improvement of the people, by driving them in the most merciless and cruel manner from the homes of their fathers, was carried out on a huge scale and in the most inconsiderate and heartless manner by those in charge of the Sutherland estates. But when one reads the other side, Macleod's "Gloomy Memories," General Stewart of Garth's "Sketches of the Highlanders," and other contemporary publications, one wonders that such iniquities could ever have been permitted in any Christian country, much more so in Great Britain, which has done so much for the amelioration of subject races and the oppressed in every part of the world, while her own brave sons have been persecuted, oppressed, and banished without compensation by greedy and cold-blooded proprietors, who owed their position and their lands to the ancestors of the very men they were now treating so cruelly. The motives of the landlords, generally led by southern factors worse than themselves, were, in most cases, pure self-interest, and they pursued their policy of extermination with a recklessness and remorselessness unparalleled anywhere else where the Gospel of peace and charity was preached—except, perhaps, unhappy Ireland. Generally, law and justice, religion and humanity, were either totally disregarded, or, what was worse, in many cases converted into and applied as instruments of oppression. Every conceivable means, short of the musket and the sword, were used to drive the natives from the land they loved, and to force them to exchange their crofts and homes—brought originally into cultivation and built by themselves, or by their forefathers—for wretched patches among the barren rocks on the sea shore, and to depend, after losing their cattle and their sheep, and after having their houses burnt about their ears or razed to the ground, on the uncertain produce of the sea for subsistence, and that in the case of a people, who, in many instances, and especially in Sutherlandshire, were totally unacquainted with a seafaring life, and quite unfitted to contend with its perils. 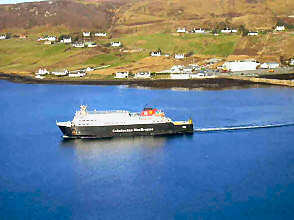 What was true generally of the Highlands, was in the county of Sutherland carried to the greatest extreme. That unfortunate county, according to an eye-witness, was made another Moscow. The inhabitants were literally burnt out, and every contrivance and ingenious and unrelenting cruelty was eagerly adopted for extirpating the race. Many lives were sacrificed by famine and other hardships and privations; hundreds, stripped of their all, emigrated to the Canadas and other parts of America; great numbers, especially of the young and athletic, sought employment in the Lowlands and in England, where, few of them being skilled workmen, they were obliged---even farmers who had lived in comparative affluence in their own country---to compete with common labourers, in communities where their language and simple manners rendered them objects of derision and ridicule. The aged and infirm, the widows and orphans, with those of their families who could not think of leaving them alone in their helplessness, and a number, whose attachment to the soil which contained the ashes of their ancestors, were induced to accept of the wretched allotments offered them on the wild moors and barren rocks. The mild nature and religious training of the Highlanders prevented a resort to that determined resistance and revenge which has repeatedly set bounds to the rapacity of landlords in Ireland. Their ignorance of the English language, and the want of natural leaders, made it impossible for them to make their grievances known to the outside world. They were, therefore, maltreated with impunity. The ministers generally sided with the oppressing lairds, who had the Church patronage at their disposal for themselves and for their sons. The professed ministers of religion sanctioned the iniquity, "the foulest deeds were glossed over, and all the evil which could not be attributed to the natives themselves, such as severe seasons, famines, and consequent disease, was by these pious gentlemen ascribed to Providence, as a punishment for sin." I might just add that Beth does these issues in pdf format which also makes it easy to print out. Should any of you do this you might donate the printed copy to the local library for others to read.